The Advisor Assistant is a brand new iOS app for Sephora store associates (Beauty Advisors) to use while engaging with customers. It incorporates clienteling elements such as waitlist, viewing client data, and reservations; and also allows one-stop access to Sephora specialty tech such as Digital Makeover or ColoriQ scanning experiences. Over 40 devices in each store, and not all digital tools available on all devices, causes a confusing workflow for store associates and an inconsistent experience for clients. Digital experiences in Sephora stores from left to right: Digital Makeover guide, ColoriQ, SkiniQ scanner, Sephora Visual Artist (VR assistant), and digital makeup skill classes. There are many different types of users in Sephora stores (leadership, new hires, category specialists such as skincare or fragrance, cash wrap, etc.). However, for the purposes of this project we are focusing on 1 user type: a mid level in store associate who interacts with customers daily. We'll call her Raquel. 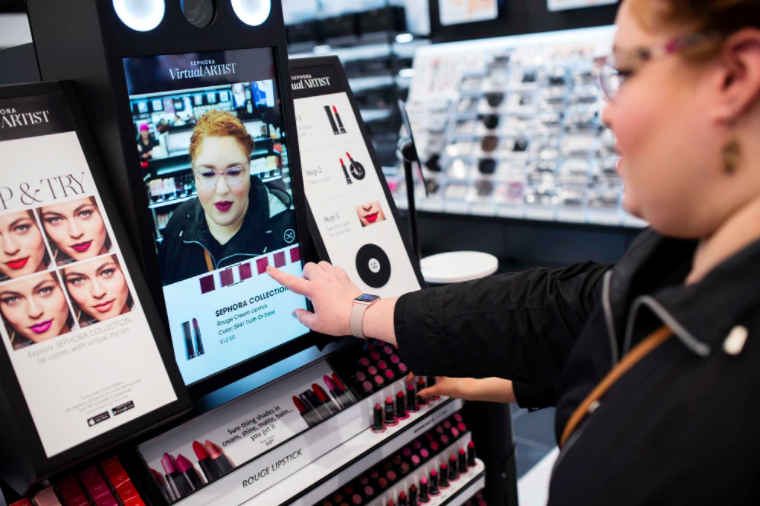 Create an all-in-one ‘Digital Wingman’ for Sephora store associates; to streamline their workflow and enhance their ability to create memorable experiences with customers. I was the Lead UX Designer for the Sephora Advisor Assistant project. My role included designing the interactions, information architecture and user flow of the experience as well as analyzing research insights into actionable design feedback. Too many devices, too many apps! I don’t have access to the information I need to provide excellent customer service. It’s hard to keep track of my own schedule and what’s going on in the store, because everything is done with paper and pen! In busy stores I’m always working with multiple clients, but it’s hard to “share” clients with my colleagues. Sometimes clients have to repeat information with multiple Beauty Advisors with is a frustrating experience for them and an inefficient one for us. Launched Fall 2018; currently in a Sephora store near you!